With AC2600 Wi-Fi speeds, a 1.4 GHz Dual-Core Qualcomm® Internet Processor up to 8 times more powerful than the average router and Qualcomm® MU| EFX, Greyhound is able to deliver not only incredible Wi-Fi speeds for your newest ac-devices but also a real improvement for older wireless-n devices. Instead of serving one device at a time, as routers equipped with Single-User MIMO have to do, Greyhound can serve multiple devices at once and deliver up to 3x faster Wi-Fi to every phone, computer and device in your home. Greyhound also makes sure, that time-sensitive applications such as streaming and gaming are automatically assigned a higher priority than others. 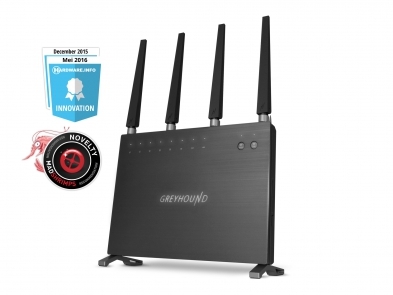 Unlike traditional Quality of Service (QoS) which treats every device and application the same, Greyhound is equipped with Qualcomm® StreamBoost™, which responds individually to applications such as Skype, Netflix and Spotify and automatically provides each application with the bandwidth it needs. With Greyhound all applications run smoothly without buffering, even in situations where a multitude of devices demands the router’s processing power. Greyhound’s four antennas can be adjusted to deliver an optimized Wi-Fi range throughout every home, even very large ones. In combination with Beamforming, Greyhound maximizes range, eliminates dead zones and creates more reliable Wi-Fi connections for all devices. The smart feature localizes your device and points the Wi-Fi signal directly at it instead of sending it out in a general direction. When you move, Beamforming adjusts the signal so you can keep streaming and gaming without glitches. Greyhound’s Band Steering feature can detect how many devices are in the network, which band they are on and if they are dual-band capable. It then automatically assigns them to the ideal band. Greyhound isn’t just a router. With four Gigabit Ethernet LAN ports, two USB 3.0 ports, an SD-card slot and analog and digital audio connectors it is also a NAS, an audio bridge and so much more. Connect 4K Ultra HD TVs or game consoles to Greyhound’s Gigabit Ethernet ports and experience lag-free gaming and smooth HD video streaming. With printers or hard drives connected to Greyhound’s USB ports, you can share them across the network. Thanks to SuperSpeed USB 3.0 and the powerful 1.4 GHz Dual-Core Qualcomm® Internet Processor, transfer speeds are up to 10 times faster than with USB 2.0. Greyhound’s SD-card slot comes in handy to stream your photos directly from your camera’s SD-card to the big screen of the TV. Greyhound also lets you connect your stereo and turn it into a Wi-Fi stereo! Plug it into the analog or digital audio port and start streaming music right away. With Greyhound supporting both AirPlay and DLNA, wireless music streaming is possible from practically any of your iOS, Mac OS, Android or Windows devices. AirPlay & DLNA streaming, printer server, FTP server, download client, Time Machine support, Greyhound has it all. Easily stream movies, music and photos wirelessly to your Apple TV, DLNA-capable TV or game console. With the download client you can download files directly to devices in the network. Greyhound also seamlessly integrates with Apple’s Time Machine feature to automatically backup incremental changes on your Mac and restore your system or specific files whenever you need to. 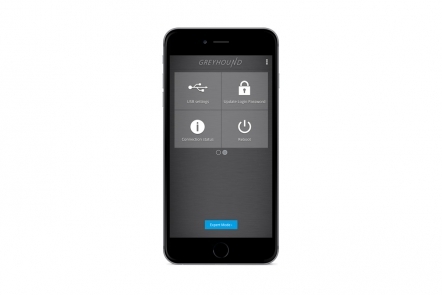 As the first router with a fully customized OpenWrt user interface, Greyhound offers almost endless possibilities. With 128MB NAND Flash and 16MB SPI Flash, Greyhound has up to 8 times more memory than the average router and plenty of room to install new OpenWrt packages to add additional features. The user interface comes with a clean and intuitive design and offers a basic mode that works like a shortcut to the most popular settings and an expert mode with access to all settings. Alternatively, you can download the free MyWiFi app and access the most popular features from your iOS or Android phone. Greyhound comes with an extensive 10 year warranty. Simply activate the long-term warranty by registering your product within 3 weeks of purchase.